Within the first 15 minutes of trading, price fell 12.4% (from previous close). When you have such a precipitous fall in such a short time, it is highly unlikely that you’re going to get a contraction in the same time period and see the trend continue for any significant further decline. As I’ve already mentioned, it is more prudent to drill down to a shorter time frame and get in the trade before the trend runs out of momentum. Zooming in to a 5 minute chart presented the low risk entry in the red circle above. Curiously enough, the decline reached the (15 minute interval) 38.2% Fibonacci extension at $7.48, marked by the dashed red line. This would have been an amazing exit. But a more realistic one would have been on the break of the 12th candle; accompanied by a volume spike. After that, the trend exhausted itself and PMCS meandered for the rest of the day. 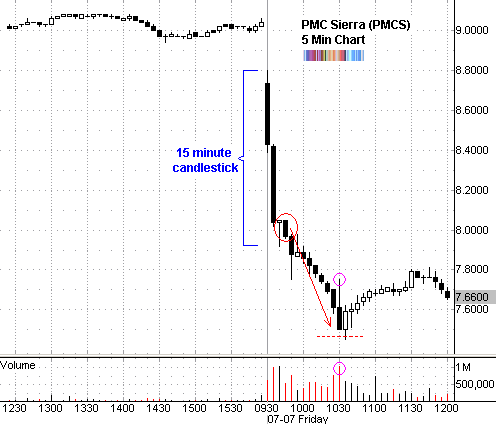 By drilling down into a shorter time frame, it was possible to take advantage of the trend with an entry just below $8. Had we continued to look at the 15 minute chart, the only entry offered was at $7.76 - which would have been a scratch trade as price rebounded almost immediately.